A battle where millimeters have become the deciding factor, the race for the title the “Thinnest and Smallest External Hard Drive” is heated. Seagate started things off with its GoFlex Ultra-portable drives. Western Digital came snapping at Seagate’s heels with the release of the My Passport Edge. Toshiba and ADATA followed right after with their own interpretations of slim externals, the Canvio Slim and the DashDrive HE720, respectively. Toshiba’s Canvio Slim is the descendant of the Canvio, another slim external from Toshiba’s line of memory storage devices. While not the fastest external drive in the market, the Canvio Slim 3.0 USB external hard drive makes up for the lack of speed in its quality looks and extreme portability. Marketed by Toshiba as the perfect companion of the ultrabook, the Canvio Slim boasts a storage capacity of 500 GB. Since it’s based on the spinning disk, the drive is not as fast as similar flash-based products. That doesn’t mean that it can’t deliver a decent performance; USB 3.0 technology is built into the drive, a definite improvement from the transfer rates of USB 2.0. As is common with the USB 3.0 flash drives out in the market, it’s also backward compatible with USB 2.0. In the area of speed performance, the drive promises a 12 ms response time. The Canvio Slim’s drive is encased within a brushed aluminum case and possesses a minimalist design that contributes to an understated elegance. Around the size of an index card, just 9mm thick and weighing just over 5 ounces, the drive is very portable. And since it includes an NTFS driver, the Canvio Slim can be read by both Macs and PCs. To make it easy to backup data to the drive, the drive offers Toshiba’s NTI Backup Now EZ, management software that’s already preloaded on the drive. For data security, the Canvio Slim comes with a password protection system. 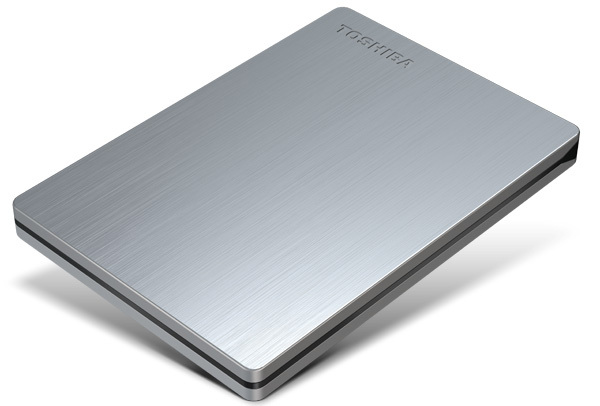 Toshiba will back the external hard drive with its 3-year warranty. The company expects to release units of the external hard drive to retailers sometime this month. The Canvio Slim’s price upon release is set at $115. This entry was posted in Toshiba, USB 3.0 Hard Drives and tagged Canvio, External Hard Drive, Slimmest USB 3.0 Drives, Toshiba. Bookmark the permalink.